TI doesn’t measure corruption directly; instead, it uses surveys of various groups to get their perception of corruption in that country. From this, it derives a score (earlier, on a 0-10 scale, but from 2012 that’s been converted to a 0-100 scale, and higher is better). The score is then used to determine the country’s rank. Besides India, I looked at China because it’s the country most often used in such comparisons. It’s consistently scored higher than India – but not by much. On the map, both countries show as the same shade of medium red. Myanmar – which is the country of my current project – is near the bottom of the range. Corruption perceptions there are dire. And the US – though not the top of the range by any means (that honor goes to Denmark, Finland and New Zealand, which each scored 90 points) – is a standard by virtue of its dominance in the world economy. In general, the rankings are not as consistent as the scores. Since the number of countries covered changed from year to year, I’ve normalized them on a scale of 0-100. (The actual rankings, which run from 1 to 174 in 2012, are available on TI’s website.) So here’s the graph of the normalized ranks. I inverted the axis this time to show the rankings visually. Again, I haven’t graphed the real winners: Denmark, Finland and New Zealand, which tied for first place, or Sweden and Singapore, which followed. INDIA had been on a declining trend since 2008, with both scores and rank falling. It managed to reverse that in 2012. Its score ticked upward from 31 in 2011 to 36 in 2012, but it didn’t improve its rank; other countries, on the average, improved their scores more than India did. So India’s rank fell to 53, slightly below average. 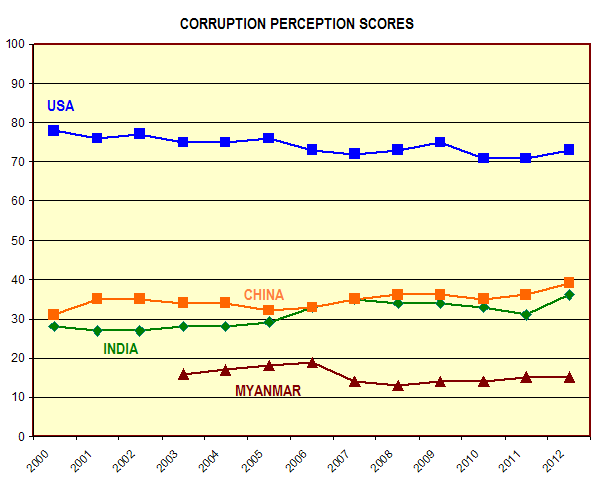 CHINA, on the other hand, has been consistently above average in its ranking since 2004, as corruption perceptions have gradually improved since a low of 32 in 2005. MYANMAR has a long way to go. 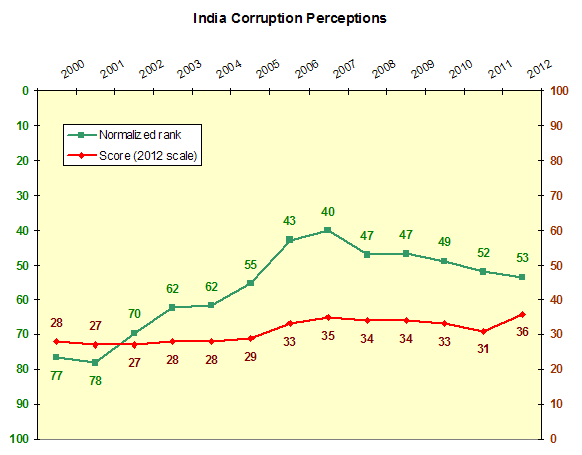 Perceptions of corruption there are very bad indeed; its score of 15 gives it a rank of 98. It’s lumped with countries like Sudan and Uzbekistan and Turkmenistan. Only North Korea, Afghanistan, and Somalia are worse (they have scores of 8, which would have given them a normalized rank of 99). How about the USA? It’s been pretty stable from 2004, not quite in the top 10% of the countries in terms of normalized rankings, but close. Perhaps it could emulate its neighbor Canada, which had a score of 84 – and a normalized ranking in the top 5% of countries. This entry was posted in General and tagged China, corruption, Doing Business in India, myanmar. Bookmark the permalink.